Reading and share top 175 famous quotes and sayings about Journalists by famous authors and people. 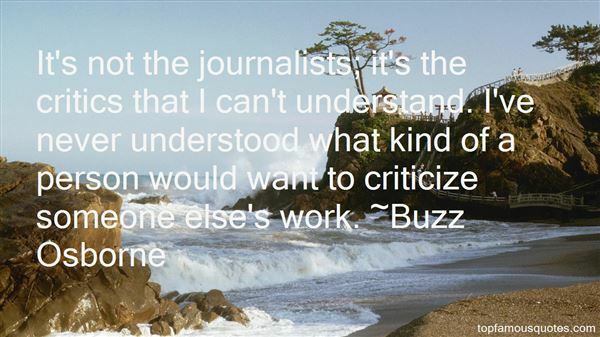 Browse top 175 famous quotes and sayings about Journalists by most favorite authors. 1. "The really clever people now want to be lawyers or journalists." 2. "Does the mainstream media have a liberal bias? On a couple of things, maybe. Compared to the American public at large, probably a slightly higher percentage of journalists, because of thier enhanced power of discernment, realize they know a gay person or two, and are, therefore, less frightened of them." 3. "The bad news for journalists today is that the media, however seriously people who are in the public eye take it, is not taken as seriously as it once was - by the public." 4. "No foundation that I am aware of has hired ex-journalists to promote a thoroughgoing inquiry." 5. "In the end, does it really matter if newspapers physically disappear? Probably not: the world is always changing. But does it matter if organisations independent enough and rich enough to employ journalists to do their job disappear? Yes, that matters hugely; it affects the whole of life and society." 6. "Press junkets are incredibly annoying. You sit in a chair for three to six hours and have different journalists shuttle in for three minutes at a time, asking cheesy movie questions to get a quick sound bite - and that's their only objective. You can't really move or eat. You're just stuck there. It's pressure, constant pressure." 7. "Sure, some journalists use anonymous sources just because they're lazy and I think editors ought to insist on more precise identification even if they remain anonymous." 8. "I hate the world and almost all the people in it. I hate the Labour Congress and the journalists who send men to be slaughtered, and the fathers who feel a smug pride when their sons are killed, and even the pacifists who keep saying human nature is essentially good, in spite of all the daily proofs to the contrary. I hate the planet and the human race—I am ashamed to belong to such a species." 9. "It's not the journalists; it's the critics that I can't understand. I've never understood what kind of a person would want to criticize someone else's work." 10. "Journalists obsess about their leads. Don Wycliff, a winner of prizes for editorial writing, says, "I've always been a believer that if I've got two hours in which to write a story, the best investment I can make is to spend the first hour and forty-five minutes of it getting a good lead, because after that everything will come easily." 11. "The truth is, I don't have any problem with journalists - I count some of them as friends - also some of my heroes are journalists, I'm a big fan of Robert Fisk - great people or crazy people who are prepared to stand up for what's right." 12. "Look at the language. If a scientist delivers the simple, unconditional, absolutely certain statements that politicians and journalists want, he is talking as an activist, not a scientist." 13. "I mean, Britain is a country of successful Muslim businesspeople, teachers and educators, journalists. So, we have to say very strongly that the two million plus Muslims in Britain, the vast bulk of them make a huge contribution to our society, and they actually make it the vibrant society it is." 14. "I never sue journalists. I employ journalists. I employ too many of them. I don't sue journalists." 16. "I've had two instances when I've met journalists face to face and we've had good interviews and I've said, 'We don't have children, by the way,' and then they've written it. I'm not sure what that's about. As misleading facts go, it's not a terrible one but it isn't true - we don't have kids." 17. "Journalists are accused of being lapdogs when they don't ask the hard questions, but then accused of being rude when they do. Good thing we have tough hides." 18. "It is inexcusable for scientists to torture animals; let them make their experiments on journalists and politicians." 19. "Publishers are notoriously slothful about numbers, unless they're attached to dollar signs - unlike journalists, quarterbacks, and felony criminal defendants who tend to be keenly aware of numbers at all times." 20. "From opinion surveys that journalists are less trusted and less esteemed than used to be the case." 21. "Journalists justify their treachery in various ways according to their temperaments. The more pompous talk about freedom of speech and "the public's right to know"; the least talented talk about Art; the seemliest murmur about earning a living." 22. "The idea that women journalists bring a different taste in stories or sensibility isn't true." 23. "Back in George W. Bush's second term, when diplomatic realism began to overtake foolish bellicosity, the president developed one of his patented nicknames for the two most powerful neoconservative journalists, William Kristol and Charles Krauthammer: he called them 'the Bomber Boys.'" 24. "Novel writing should never be confused with journalism. Unfortunately, in the case of Primary Colors, a fair number of journalists confused." 25. "We journalists love writing about eccentrics. We hate writing about impenetrable, boring people. It makes us look bad: the duller the interviewee, the duller the prose. If you want to get away with wielding true, malevolent power, be boring." 26. "I think of us as journalists; the medium we work in is blogging." 27. "Are you a journalist? ""I'm a doctor.""Good. We need doctors, Wallahi." Sadoon scowled. "Journalists only tell lies and smuggle carpets." 28. "As Americans, we rightfully place tremendous value on having a free and independent press. Our role as journalists is to give voice to the voiceless, and hold our leaders and institutions accountable. But the circle is only completed when that information is consumed by a free-thinking and engaged audience." 30. "I don't like journalists and I hardly ever talk to them." 31. "Chapter 4,‘Organised abuse and the pleasures of disbelief', uses Zizek's (1991) insights into cite political role of enjoyment to analyse the hyperbole and scorn that has characterised the sceptical account of organised and ritualistic abuse. The central argument of this chapter is that organised abuse has come to public attention primarily as a subject of ridicule within the highly partisan writings of journalists, academics and activists aligned with advocacy groups for people accused of sexual abuse. Whilst highlighting the pervasive misrepresentations that characterise these accounts, the chapter also implicates media consumers in the production of ignorance and disdain in relation to organised abuse and women's and children's accounts of sexual abuse more generally." 32. "...self-important western journalists who'd given up their sacred trust to become cheerleaders for trendy causes, the way communist journalists had once been cheerleaders for the government...They were depriving the free world of its most valuable weapon in condemning and exposing the worst human scourge since Nazism: the targeting and murder of civilians to achieve political and religious ends." 33. "Lazareff believed that "a journalists first duty is to be read," but Camus felt it was to tell the truth as much as possible, with as much style as possible. Camus saw "Lazareffism" as unacceptable journalism, a mixture of political submissiveness, raw crime, and nonsense. Pia and Camus hated the spineless large-circulation press, which followed orders and catered to its readers' lower instincts." 34. "Journalists are notoriously prone to exaggerate the beneficial impact of elections and to ignore more complex developments." 35. 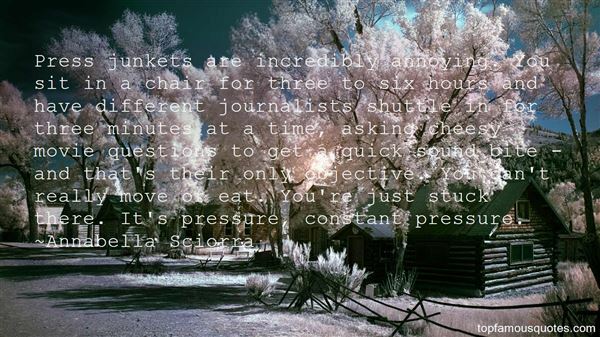 "I ask myself questions that journalists don't dare to ask or don't know how to ask." 36. "Some of our best journalists take themselves even more seriously than the politicians they write about." 37. "I think there ought to be a club in which preachers and journalists could come together and have the sentimentalism of the one matched with the cynicism of the other. That ought to bring them pretty close to the truth." 38. "There's many heroic underappreciated investigative journalists." 39. "The fact is, most journalists I know are not particularly political. They move around a lot." 40. "Strange bonds of trust and self-deception tend to grow between journalists and their subjects." 41. "Copywriters, journalists, mainstream authors, ghostwriters, bloggers and advertising creatives have as much right to think of themselves as good writers as academics, poets, or literary novelists." 42. "I don't think journalists in World War II were objective about the Nazis, and I don't think they should have been." 43. "People think because 'Vice' is irreverent and because we're crazy, we're stunt journalists. You know what? I don't actually care." 44. "The journalistic code of ethics governing the broadcasts requires that opposing views be presented, and that journalists' personal opinions or judgments be left out of factual reporting." 45. "The reason why she had chosen journalism was because of those who had done so before her. Stalwart women and men who reported stories in the days before the Internet. Before it was fashionable to learn Mass Communication. A long time before being a TV reporter and calling up your family to see your face beamed to their homes was an in thing. They were those who had left their families behind as they pursued the truth, opting to go to jail when the government hounded them to reveal their sources. Men and women that would rather quit than write editorials the management wanted them to write. Journalists who never wrote a word they would have to disown. Journalists who took their last breath as they wrote an article was true to what they believed in. They would never sit down and take stock of the stories they had covered and written saying, "So what if twenty of these are non-stories, I at least had five I believed in." 46. "As journalists, because you don't carry a gun, you sort of become this observer." 47. "Politicians are just Daily Mail journalists writ large, aren't they? They're always telling us what's going to happen, and we know they don't know!" 48. "Judy Miller is the most innocent person in this case. I really thought that was outrageous that she was jailed and we needed as journalists to draw a line in the sand in a strong but thoughtful way." 49. "I'm sorry I'm not gay or Jewish, so I don't have a special interest group of journalists that support me." 50. 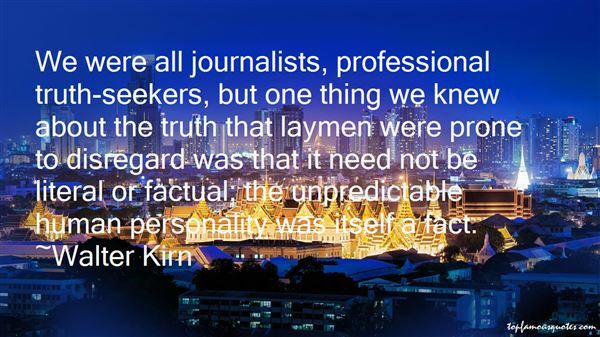 "We were all journalists, professional truth-seekers, but one thing we knew about the truth that laymen were prone to disregard was that it need not be literal or factual; the unpredictable human personality was itself a fact." (on A History of Western Philosophy) I was sometimes accused by reviewers of writing not a true history but a biased account of the events that I arbitrarily chose to write of. But to my mind, a man without a bias cannot write interesting history - if, indeed, such man exists."